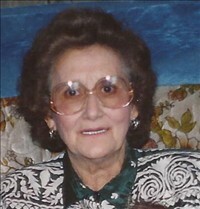 Elva Guadalupe Salias Garner, 77 of Rupert, Idaho passed away Monday, November 28, 2011, at Countryside Care and Rehab in Rupert. Elva was born February 2, 1934, in HebronVille, Texas to Guadalupe and Maria Elisia Garza Salis. She married Frank L Garner in 1953, in Burley, Idaho. They homesteaded in Acequia in 1966. She worked for A & P, driving truck, custom farming, and taking care of dad and her children. Her favorite job was running the family shop, 1 Lazy F Tackel Shop. She was a Teamster Union Representative. In April of 2007, she became a Born Again Christian. Elva loved fishing, hunting, camping, gardening, cooking and feeding everyone she came in contact with. Elva is survived by her children, Linda (Ed) Timmons of Rupert, Calvin (Susan) Garner of Rupert, Don (DeeAnn) Garner of Acequia, Carroll Garner (Mike Earl) of Rupert, and Allan Garner of Rupert; 14 grandchildren; and 31 great grandchildren. She was preceded in death by her parents; husband, Frank L. Garner; daughter, Sallie Anderson; son, Frankie; four brothers; father and mother-in-law, Les and Amy Garner; and Jay Garner. Funeral services will be held 11:00 a.m. Saturday, December 3, 2011, at the Hansen Mortuary Rupert Chapel. Viewing for family and friends will be held from 6-8:00 p.m. Friday, December 2, 2011, at the mortuary and for one hour prior to the services. Services will conclude with burial in the Rupert Cemetery under the direction of Hansen Mortuary.